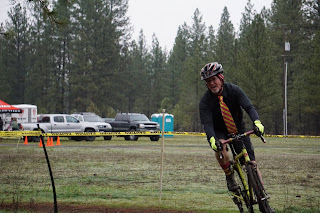 Today was the last cyclocross race of the season locally. 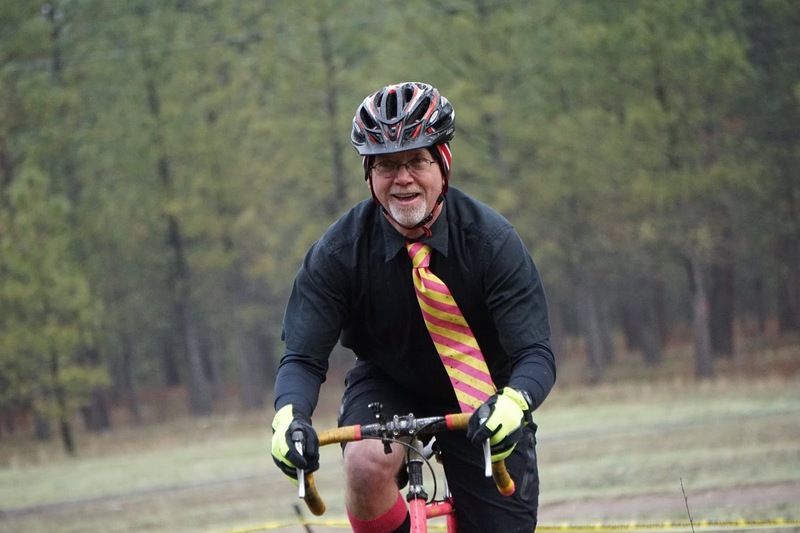 I entered three races: single speed, Cat 4, and masters 60+. They were in that order and back to back. John Abernathy of The Bike Hub and Simon Hartt of Two Wheel Transit had their trailes and tents set up just beyond the finish line. I stopped by and asked if they were doing beer hand ups. John pointed to the two cases, "PBR or Rainer?" I went with PBR. I l opened a can and either John or Simon handed it to me when I stopped by during each lap. I went through one can per race. 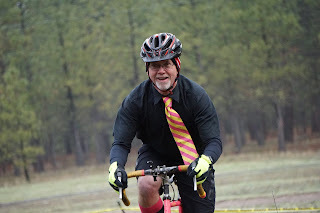 I managed to get my five laps in for during the first two races even though I was stopping for beer each time. In the second race I finished my fourth lap in the knick of time so I got to do one more. I knew that wasn't happening in the third race. 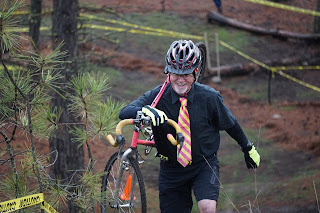 I was beat and those 40+ and 50+ masters tear the course up. To ease my pain I accepted additional PBR hand ups. One on the long straightaway to the finish line. (I stopped and traded cans with Simon.) And a couple at the run up. There were also peeps at the run up. Those didn't go down as good as the beer. Once I was done racing, I cleaned up and stationed myself at the run up for the juniors race. I had a wad of one-dollar bills and a couple of fives. The kids have it really tough on the run up and grabbing a dollar bill or two helps make their day. But they're really focused on getting up the hill so you have to get their attention to look for the money. Their reactions are great. "Money? Where?" Look all around. Spot it. Drop the bike and go grab it. 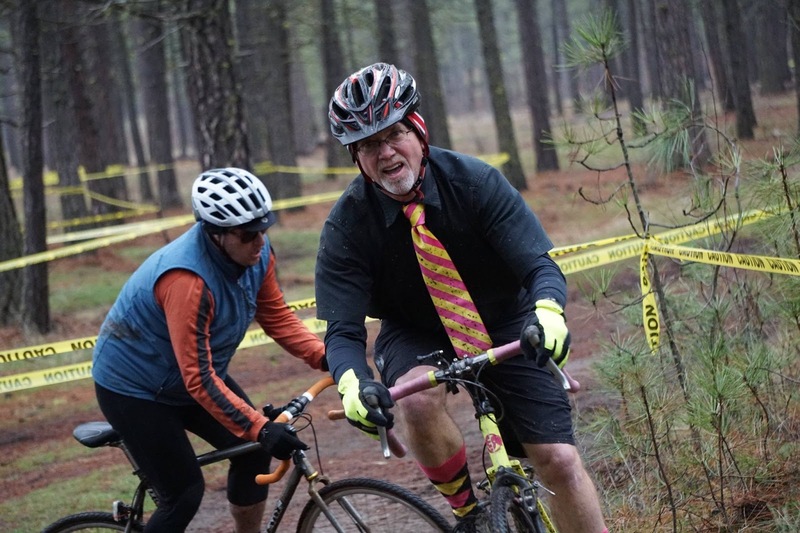 Single speed fun in race #1. Early on in race #1 so I'm still all smiles. 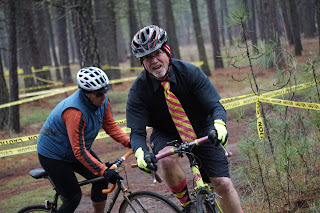 Race #2 with the inestimable John Speare fixin' to pass me. Race #3. I'm pretty tired. Thing I'll go home now.